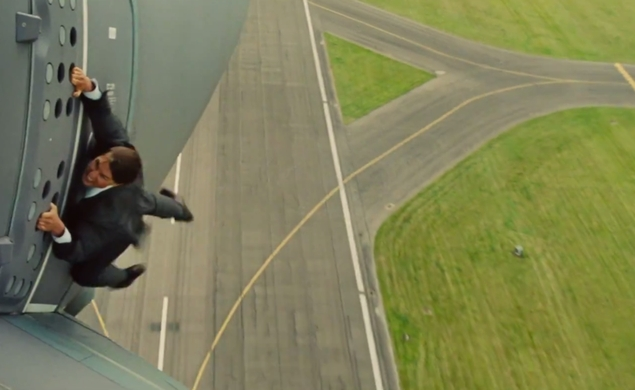 If there’s one theme that appears to be running through this summer’s upcoming Mission: Impossible—Rogue Nation, it’s star Tom Cruise’s total disregard for safety. As disgraced IMF agent Ethan Hunt, Cruise is tasked with hanging off the side of a flying airplane, engaging in a highway-set game of motorcycle chicken, and diving into what looks like a man-made whirlpool. The whole film looks wild (and, frankly, pretty anxiety-inducing), and these are only things we’ve seen in trailers. Who knows what the final film will hold, but we’re guessing it’s going to put the jawdropping stunts of Mission: Impossible—Ghost Protocol to shame. The newest M:I adventure picks up after the IMF has been not just disbanded, but utterly blown apart by charges of corruption and generalized evil. Ethan and his gang—including Simon Pegg’s Benji Dunn, who appears to be taking an even more active role in this film—set about rooting out the real bad guys (the so-called Syndicate) and saving the good name of the IMF. Fine, it just looks like a big excuse for some mega-splashy stunts, and that’s okay by us. Has anyone made a Mission: Impossible supercut that imagines that the films are just buddy comedies starring Cruise and Pegg? Can someone do that now?